When it comes to shoes for men there are hundreds of brands that vie for their attention but only a few of them manage to convert a customer to a brand loyalist. Amongst the hundreds of brands Louboutin is by far the most popular luxurious brand today. French luxury footwear and fashion designer, Christian Louboutin started the brand with the signature red-soled shoes in his shoe designs. The Louis Strass Men’s Flat from Louboutin is priced at around $3,295 and is certainly amongst the top most expensive shoes for men by it. This is considered a step up to the next level in the shoe collection for the die-hard Louboutin fans. This particular shoe has multicolored ‘clair de lune’ crystals adorning the sneaker of neon leather trimming with Technicolor laces. 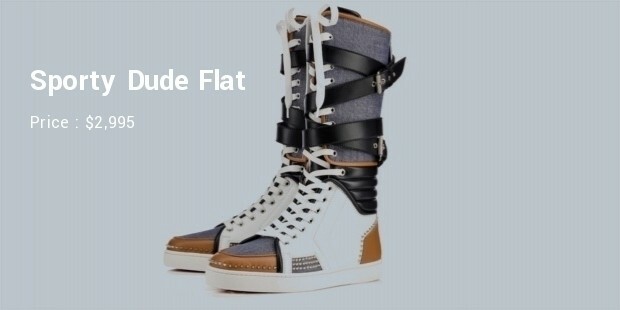 The Sporty Dude Flat sneakers for men by Louboutin is priced at around $2,995 and is one of the most radically unique designs by the brand. This is a special multi-material sneaker with a back-zipper. It also displays touches of the typical silver mini-spikes and bumps and is knee-length in style with striated buckle-straps all along the sides. The New No Limit is a high-top sneaker and is priced at around $2,645. This sneaker is truly a work-of-art with the signature ‘clair de lune’ crystals adorning its sides with mini-spikes of metal on the toe. This particular sneaker comes in a unique rainbow python leather material. 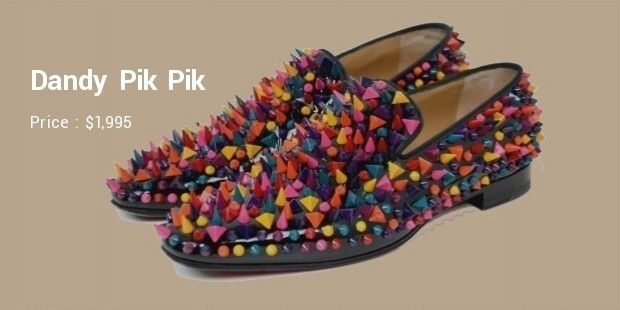 The Dandy Pik Pik is one of the most unconventionally stylish dress shoes from Louboutin and are priced at around $1,995. These are original black veau velours ‘Dandy’ loafer which is totally covered with half black and half gold colored ‘demi lune’ multi-level spike. These are perfect to carry off the classic ‘rock-and-roll’ look for the party. 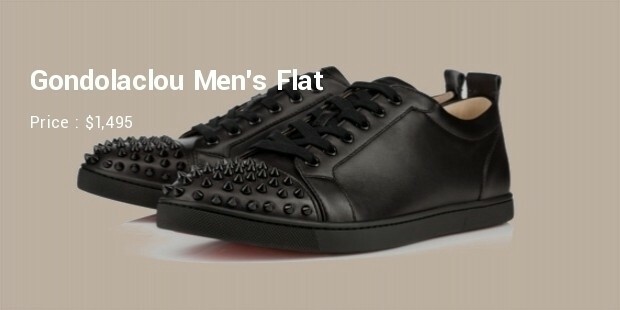 The Gondolaclou Men’s Flat by Louboutin is stylishly designed and priced at around $1,495. These are unique sneakers made from electric roccia python material. This mixed-material low-top sneaker has a spiked toe box that gives it a unique style. 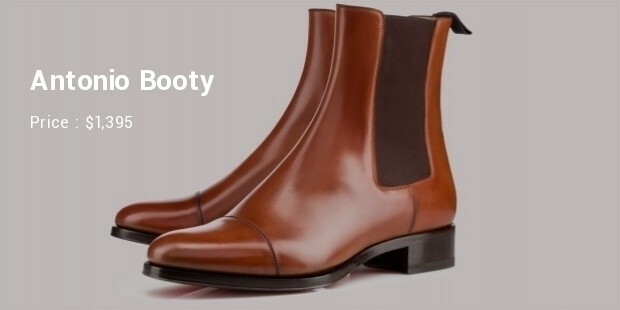 The Antonio Booty from Louboutin is priced at around $1,395 and is one of the best boots for the Fall/Winter season for men. This soft calf-leather boot has been shaped to reflect the ultra-masculine design that is most versatile. It comes in classic black and goes with most attire. The Louis Orlato Spikes Men’s Flat is priced at around $1,295 and are a favorite among the red-sole lovers. These are sleek and simple in design which makes them suitable for almost all kinds of activities. With the prominent Louboutin logo fixed to the inner side, these high-top sneakers are made from patented Hawaiian-print leather. 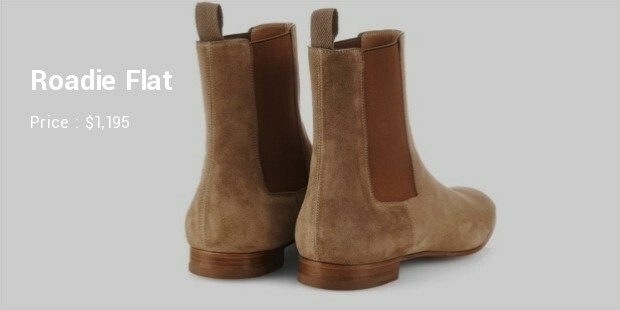 The Roadie Flat boots by Louboutin are considered to be the best city boots by the designer for men. These are priced at around $1,195 and feature a thin and flexible sole with a narrow heel. It is made from genuine soft calf leather and also has the brand’s signature red soles. 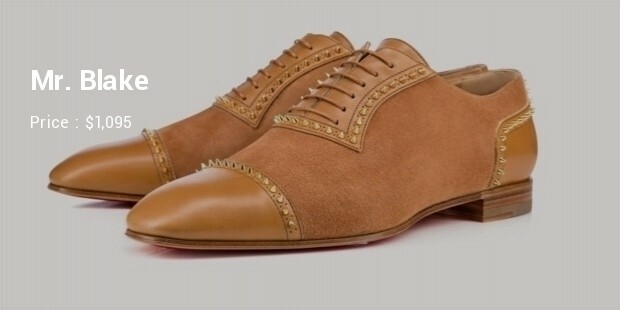 The Mr. Blake brogue shoe from Louboutin is priced at around $1,095 and is a highly stylish men shoe from the brand. It has miniature gold spike trim and is a one-of-a-kind shoe from the designer and is made from suede combining with noisette leather. The Discretough is also called as the next generation of sneaker design and is priced at around $1,045. This is a leather-crafted sneaker and is completely lace-free with a fold-over leather panel in the front getting fixed with two signature striated buckle straps to the side. Louboutin continues to be one of the most sought-after men’s shoe designer brands in the world today owing to its truly glamorous designs as well as the use of the most unique materials to make their creations. 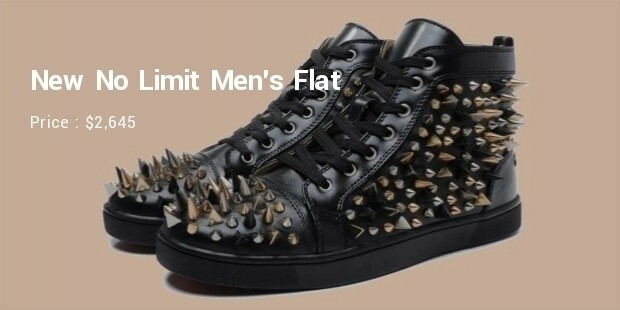 It is no wonder that the Louboutin brand shoes for men sell at such expensive prices.